I calculated how much money I could save on the cost of bread over a lifetime if I make it myself instead of buying it. I will probably be monetarily poor for the rest of my life, so it is good practice for me to live on less than $1 a day for food this year. I could not do this project if I didn’t have a garden or live in a rural area. I realize that bread is not the healthiest food but it is cheap, calorie dense and versatile. I eat about 1.5lbs(24oz) of bread per week. If I bought bread every week, it would cost $2.70 for a low-quality sandwich bread filled with preservatives and bleach. The cost per year for buying bread is $140.40 and making the same amount is only $53.04. If I use the 5lb flour at $2.44, the difference for buying bread vs. making it is $87.36/yr. I do realize that it doesn’t seem like much, but by putting that little bit of money in a low-interest (1.35%) account every year for 35yrs the total adds up the over $4,000. I am simplifying the effects of inflation and other factors over time, but it is amazing how one small change can lead to a significant amount of savings. Bread machines are an excellent investment and can usually be bought cheaply at yard sales or a flea market. All of the ingredients I use can be bought for much less. 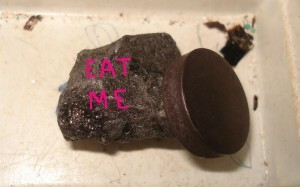 Magnetite with a magnet attached to it. I wanted to know more about this topic, so I searched phrases like “magnetite brains” and came up with some unusual google results. I have found very little actual information as to why magnetite is produced in our brains, but I did find a lot pseudo-science and fraudulent claims for the benefits of ingesting it. Magnetite is an iron oxide which some people eat believing that it will increase their iron levels. I’m not even sure if the body absorbs that type of iron because most supplements given as prescriptions are iron sulfates. An individual can only absorb about 100mg of iron per day while the rest passes through the system. There are several pills, powders and potions that advertise the main ingredient as magnetite. It is touted as a miracle drug which the manufacturers claim can be used as a cure for restlessness, tremors, convulsions, irritability, dizziness, vertigo and blurred eyesight. The “magic magnetic pills” can act as a stimulant like coffee but also have the ability to calm the spirit. It is said to balance the hemispheres of the brain. Nutritional reasons and homeopathic remedies are not the main reason for the product, though. There is a belief that magnetite supplements increase telepathic and psychic abilities. I have never been able to understand why anyone would want the ability eavesdrop on the thoughts of others. I don’t want to know the uncensored things that people think. What goes on in my mind is confusing enough. Do you want to know what goes on in my mind the majority of the time? Repetitive thoughts and phrases. Electricity and magnetism are really two forms of the same thing. A strong magnetic impulse can change the electrical signals in our brain. A relatively new technology called Transcranial Magnetic Stimulation (TMS) uses a powerful magnetic pulse to control a person’s motor skills. The neurobiologist uses a map of the brain and then places the powerful magnet over a particular area of the skull to manipulate a specific body part. The video I watched showed how the pulse could make a man’s fingers or toes move. It even has an effect on someone’s speech. For example, a man was counting and his speech became slurred when the magnetic pulse was placed over a specific part of the skull, but immediately after it was removed his speech returned to normal. The clinical use of TMS is used as a possible treatment for psychiatric illnesses such as depression and also to control physical pain. I read an article from livescience which stated that a protein found in the human retina, when placed into fruit flies, has the ability to detect magnetic fields. It is thought that many animals sense magnetism through proteins called cryptochromes. They placed the fruit flies into a T-shaped maze, with each arm equipped with a coil wrapped in such a way that when a current was sent through it, the coil became magnetized. The team varied which side was magnetized and its strength, which went up to eight times that of Earth’s magnetic field. The flies with the human cryptochromes showed sensitivity to the magnetic fields – either avoiding them as they might naturally do if not acclimated to the magnetism, or showing a preference for the magnetized arm of the maze when trained with sugar rewards to go toward the magnetic field. The human protein only worked in the blue range of light, the researchers found. Personally, I would have liked to have been a fly on the wall when this experiment was being carried out. I have worked with a number of fruit flies in biology lab, but I’m not exactly sure how one goes about training a fruit fly to do anything. The study also used an unnatural level of the Earth’s magnetic field, so the findings are not particularly useful in actual conditions. Do you see what he said? “Birds also use the sun and stars to navigate, but we’re not certain how.” I think that birds navigate more by the sun, stars and landmarks than by magnetic fields. If birds relied solely on magnetic fields, then it wouldn’t matter if they traveled during the night or day. Sea turtles are also said to use the Earth’s magnetic field to navigate, but I find that somewhat doubtful. When sea turtles hatch, they will try and walk toward the light of the moon reflected on the surface of the ocean. If there are street lights nearby, then they will walk toward those. The baby sea turtles are relying more on their sense of sight and not using the Earth’s magnetic field to find the ocean. I received the Beekeepers' Yellow Book for state of NC in the mail the other day and I'm in it :) The caption says, " The Official Handbook & Directory of the North Carolina State Beekeepers Association, Inc."
Circled pollen in honey. The pollen is layered in the perfect little cells. I was reading through a beekeeping catalog and there is a warning for the fresh pollen. 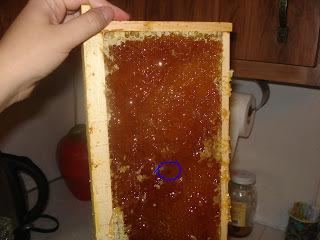 I have eaten pollen from when I extracted honey this summer and it is very sour. Sometimes people ask me about using honey for pollen allergies, and I tell them that if they are highly allergic to something, then they probably shouldn’t eat it. My grandmother developed an allergy to honey late in life and couldn’t even use soap containing honey. For the vast majority of adults, though, there is probably little danger in eating local honey. Many people buy this pollen to eat. We strongly warn that this pollen is very fresh and strong. Should you have allergies, ingestion should be done under the care of a physician. I haven’t needed to use Omeprazole (Prilosec) in over a year. A few years ago I went to a German doctor who told me that I would never be able to be off medication for acid reflux. I believed him because German doctors are not as inclined to prescribe medication as most doctors are in the US. He told me that I needed a gastroscopy every three years to examine if I had pre-cancerous cells in my esophagus. I think my restriction of milk and meat is one of the best health decisions I have ever made. I also had gallbladder issues for a long time and that pain is gone as well. The problem is that healthy and dead people are not valuable to pharmaceutical companies, but chronically sick people are a trillion dollar a year business. Natural plant medicines usually can’t be patented, making financial incentives for needed research much less likely to be forthcoming than they are for the development of pharmaceutical drugs which can be exceptionally profitable to investors. 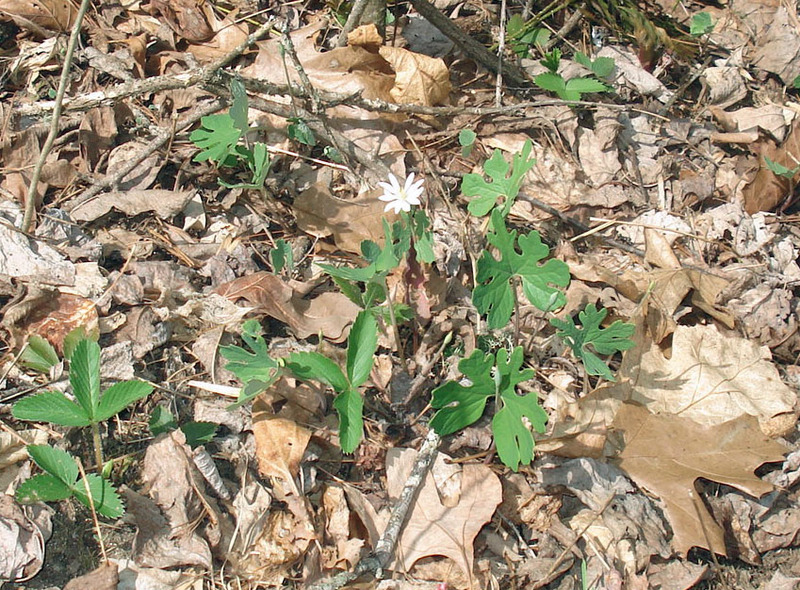 Also, plants can vary widely in the amounts of medicines they produce. The textbook contains a list of plants in the appendix with medicinal uses. 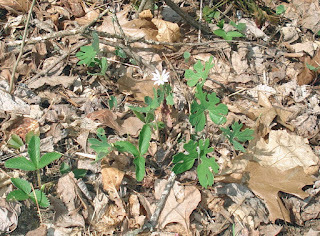 Bloodroot was at one time used against ringworm and as an insect repellent. Many plants have an effect on women’s hormones and can function as a birth control. Cotton root bark was used by black slaves and Native Americans to induce abortions. Horseradish can supposedly be used to treat infections of the urinary tract. Joe-pye weed root is said to prevent formation of gallstones. St. John’s wort is used as a treatment for depression, and in Germany it can only be gotten with a prescription. We live in the best time in human history to be healthy. Most people in this country don’t have to worry about contracting cholera or dysentery from contaminated water. We are not prey for large animals or even tiny parasites. Because of antibiotics, there is little risk of dying from infection. In the not so distant past, a freak snowstorm or extra rainy summer created a situation where starvation was a real threat. Nobody should suffer from malnutrition in this country from lack of healthy food, but oddly many obese people are malnourished because of high-calorie nutrient poor foods. What we eat can help us or harm us and it is mainly our choice to use the opportunities we have to be healthy. My first flying pig. See my creative abilities? I was having a discussion with a friend of mine the other day about wild game and the danger of contracting various parasites. In the past eating undercooked pork was a major culprit in contracting Trichinella spp., so it is understandable why there were religious mandates excluding pork from the diet. There are less than a dozen reported trichinosis cases in the US per year, so the danger is virtually non-existent because people generally cook wild game well and those who do raise their own pigs probably do not feed them raw meat. I recently read a book called “Mountain Fever” by Tom Alexander, and he mentions how mountain people would capture hogs during the winter to eat. Feral pigs are a huge problem for the environment and there are people employed by the national park whose job it is to track and shoot them year-round. I worked with a young woman, who grew up very impoverished, and her family still practices the fattening a wild hog for two weeks before butchering it. I can’t imagine how much work it would be to find, capture and slaughter a hog. In those days, many of the hardy mountain folk “raised” half-wild razorback hogs for their meat, their livelihood, their sport, and as an excuse to get away from home. The razorbacks ranged the mountains, including by permit, the national forests under my care, and one of my duties was to issue permits, collect fees, and check on ranges to avoid overgrazing. There were hundreds of these permittees. I found it interesting that a hog’s “owner” would cut a certain pattern in a young pig’s ear to be able to recognize it later when it would be found and butchered. The razorback never saw the home of its owner until the fall he was led out of the mountains with a rope tied to one leg, fattened for a couple of weeks on corn, and slaughtered. The rest of his life, he sought his own living from the forest. By late December, the nuts were gone, and the man went out yet again and drove, let, or tolled in one or more candidates for killing. The killing was accomplished by the blow of an axe to the head. Then, the carcass was immersed in a barrel of water brought to the boil by means of large rocks heated in a fire. It is a brutal way to die, but at least the animal didn’t suffer for long. Imagine how many more vegetarians there would be if people had to see where their ham sandwiches actually come from. My goal for 2013 is to take more trips around western NC. I have lived here most of my life, yet I feel like I’ve explored so little of the area. I haven’t even seen the tallest waterfall east of the Mississippi and it is only a little over an hour from my house. I have come to realize that I need to get out more. Construction on the Parkway started September 11, 1935 and took 52 years to finish. It’s amazing that within 5 years nearly 300mi of the Blue Ridge Parkway was completed. There are over 26 tunnels, many bridges, 200 parking areas, and the road ascends to over 6,000ft. It was such a huge construction project for a road that is not even open to commercial traffic. The main goal was for the government to give people jobs during the Great Depression. The section of the Parkway I use the most is the Waterrock Knob trail (Yes, Waterrock is one word). The trail is only 1.2mi and takes me about 35min to hike to the top of the knob, but I walk slow and take pictures of all the garter snakes I see :) There is a wrecked Cessna on one of the side trails, but there are no signs telling people where it is. The parking area is a perfect place to watch sunsets and meteor showers. Tourists ask me a lot of times about places to hike and I tell them to go to Waterrock Knob because it is only a 10min drive from the restaurant. One young out-of-shape couple came back after their walk and told me that it was the hardest trail they had ever hiked. I felt sorry for them because they must get out less than I do. This was a front page ad found in a Brevard, NC newspaper on February 22, 1907. It is encouraging people to buy from local sources rather than from Sears, Roebuck & Company based in Chicago. I really don't like shopping or going into stores, so I am guilty of purchasing things from non-local businesses by buying online. I do like my food sourced locally, though, because I prefer to know the farmer. Most of the fruits and vegetables I eat are grown by me. Because of the crazy weather last year, I had to buy apples from a local orchard, but I don't mind giving financial support to people in my community. There is a movement in this country to buy American made products. If more people bought things made by Americans, then more jobs would be created and that would raise the standard of living for everyone. As I type that, I realize that my Toshiba computer was not made in this country. The car I drive is also from a Japanese company. The couch I'm sitting on was probably made in China. Oddly, the shirt I'm wearing is from American Eagle Outfitters which suggests made in America, but it was really made in Vietnam. The vast majority of my clothes are from second-hand shops, so I don't feel so bad about wearing them because I was not the original buyer. Most of the other items in my living room are antiques and were made in America or Europe by someone who could have been my great-great-great-great grandfather. Right next to me is a large grandfather clock, which is a couple hundred years old, and was made in England. The woodstove used to heat the house is from the Buck Stove Company and is located only about 80miles from my house. The large rocks used for the wall around the fireplace are all from the yard from when my dad built the house. There is pottery sitting on my mantle that was made in the basement. You can't get anymore local than that. My goal for 2013 is to spend less than $1 per day on food. The amount does not include garden, chicken and bee expenses or food that I buy locally. I'm also not counting food from parties, free food I eat at work, or food someone happens to give me. The bottom list includes items I will have to buy again at some point this year. Unless I can find a local source for butter, I will have to buy more from a grocery store. I have figured I can have about 85 pots of coffee with the amount I have. More than likely, I will eat more than 10lbs of sugar this year (the average American consumes 150lbs per year). House Autry Seafood mix is the brand of breadding that I like for fried squash and trout. There are cheaper versions of all the items on this list and this project can be accomplished for less, but I prefer certain brands over others. For example, I usually purchase King Arthur's flour which is more expensive than other flours, but I like the fact that it is an employee-owned small company.